And San Francisco, Stockton and Sacramento were the world’s three “most polluted cities” on Friday morning, according to CNN. 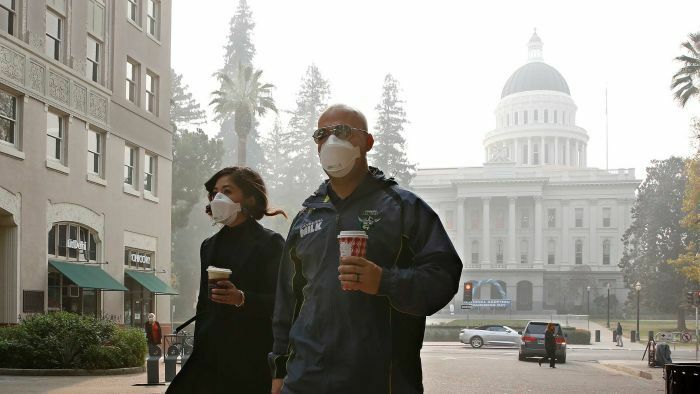 “It’s kind of freaky to see your whole town wearing air masks and trying to get out of smoke,” he said. Michael Northover, a contractor in the city, said the air smelled “like you were camping”. “We’re all kind of feeling it,” Mr Northover said. “We tried to provide a little relief by giving out all the masks we had available to those that needed them for free, ” the company said on its website. “Wildfire season used to be June to late September. Now it seems to be happening all year round. We need to be adapting to that,” Wayne Cascio, a US Environmental Protection Agency cardiologist, said this week. “Very little is known about the long-term effects of wildfire smoke because it’s hard to study populations years after a wildfire,” John Balmes, a University of California professor of medicine who studies air pollution, said.